Hi I am having troubles linking two forms. 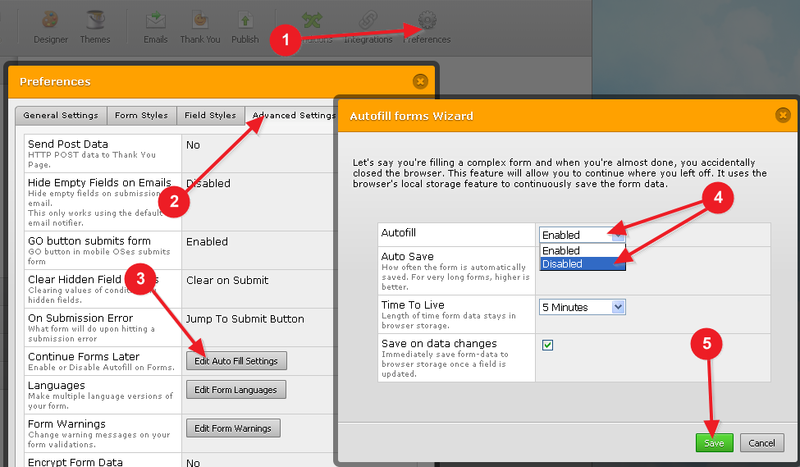 I have been using the guide http://www.jotform.com/help/97-How-to-Save-Forms-and-Continue-Later to save forms to continue later and also trying to prepopulate the data entered in the original form to autofill into the second main form. The problem I'm having is that when I go from the original form to the main form it is not autofilling with the data in the original form, instead the data is simply populating with other data in another form I filled in earlier. I have checked your prepopulation parameters on the first form, and they are implemented well and working great. The problem on the main form comes from the fact that it also has Auto Fill enabled - so the Auto Fill is placing the earlier values your browser has stored in its cookies. As both the Auto Fill feature and prepopulation are trying to insert their own values, they are in conflict with each other on which value is going to be placed. Please let us know if this fixes the issue you are experiencing. Ok, I've done this and it works - I realised also that when I was testing I hadn't completed submitting previous sessions with the same email address from the main form, and hence it kept reverting to the original data. But now I have another problem. It seems the URL link generated will break if some of the details have spaces in the first form. For example if you select in the first form in the branch dropdown list 'NSW & ACT', or if you add two words in the first name field like 'Peter John' the link will not automatically add '%20' for the spaces in the URL - so the link breaks. How can I ensure that the link will render correctly?